The highlight of the “us” time afforded to us by having the grandparents visit, was Daniel’s and my date night last Monday. Our 10th anniversary is coming up next month, but since we won’t have child care on our anniversary, we decided to celebrate early. 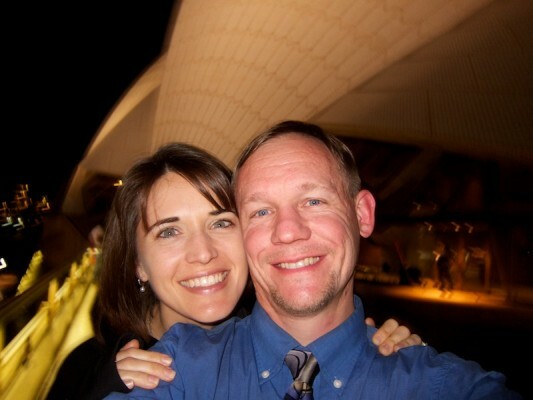 We had gotten tickets to see a symphony at the Opera House. I’d heard that while everything shown at the Opera House is good, opera is what’s really special there… but honestly I didn’t think my emotions could handle anything with a story line (especially the story lines of most operas!) I get very emotionally engaged in movies/films/stories and, after all the stress I’ve been through the last few months (moving here, plus some family stuff), putting my heart through the tragedy and drama of Macbeth just seemed masochistic. So a symphony it was. My mom was wonderful enough to start her babysitting gig an hour early so I could get ready in peace. It was so nice to feel like a woman again, and not just a mommy! I could actually wear a necklace for once, which as all moms of toddlers/babies know is usually only to be done with a piece of junk jewelry that you just want to get rid of because it will be yanked on within moments of putting it on. Even though plenty of people don’t dress up for the symphony, we definitely wanted to – dressing up is fun! (Well, I think so anyway, and Daniel doesn’t mind appeasing me). When we moved here back in August, I’d packed a formal dress but hadn’t brought any shoes. So someone at church here loaned me a pair. They were great… at least appearance-wise. Comfort-wise is another story. After walking down the hill for only about 10 yards, I realized I could have been a special episode of “Alias,” with Marshall prepping me for a mission by explaining his genius in disguising a torture device as a simple strappy heel. Those shoes were brutal. The bright side is that it was warm enough for me to go barefoot most of the way to the restaurant. Needless to say I was glad I hadn’t worn stockings. After we arrived at the restaurant and I’d had my coat “cloaked” (! ), we were seated. We had decided to get cheaper seats at the symphony, in compensation for getting a more expensive dinner beforehand. Guillaume at Bennelong (the restaurant that is attached to the Opera House) had been our first choice, but we discovered that it’s unfortunately closed on Mondays. Although we were at first disappointed, I think this ended up being fortuitous because we then made reservations at Aria – an incredible restaurant right next to the Opera House. 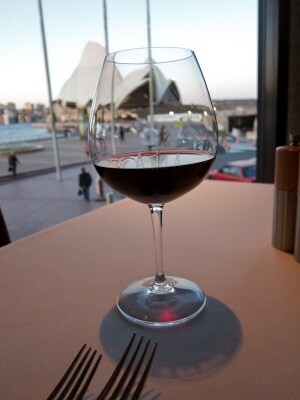 So instead of eating in the Opera House, we got to eat while gazing at the Opera House, which in my opinion is much better! And we didn’t just get a tiny peek at the Opera House either. 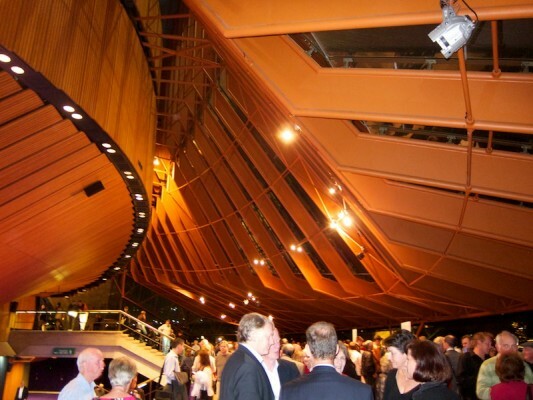 Someone once said that when eating at Aria, if you were any closer to the Opera House you’d be in the audience, and they were right! It was the most spectacular view. 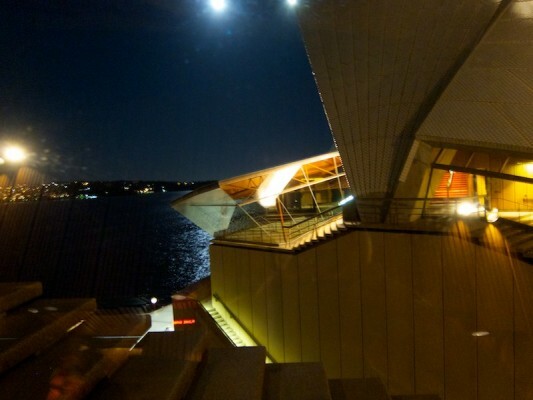 Daniel requested a table with a view and we got the best seat in the house – dead center in a wall of windows, looking right out onto the Opera House, the bridge, and the harbour. When we were seated, the waiter/sommelier/__? asked if we’d like wine, so I asked what red wines they had. She responded by asking what kind of wine I like … and … crickets. I had to confess to her I had no idea. So she helped me out by asking if I liked something lighter, mentioning a rosé, and I said that sounded great. Nothing like letting everyone know up front that you NEVER eat somewhere as sophisticated as this. But I’m sure they all knew that anyway, the moment I handed them my $5 wool/polyester coat to cloak. Sweet. I tried to remember things I’d heard before like “start on the outside and move in,” when it comes to all those pieces of silverware. Or, “let the host put the napkin in your lap and push in your chair,” etc. Neither Daniel nor I knew what to do with our elbows the entire meal, though. We always rest our elbows on the table at home (even though I know that’s considered rude by many people), but tonight it felt so noticeably out of place. And… is that just when your food is on the table? or if they are removed is it then ok? At the next table were two couples who seemed to have traveled a lot together (their version of the game “What place would you visit again?” was so long and filled with names of countries I’m so unfamiliar with, that I can’t even remember an example to share with you). They seemed about a million times more comfortable in a restaurant like this than us, and they also knew a lot more about wine than us. This made for fascinating eavesdropping. They had particularly carrying voices (or at least one man did), so I didn’t really feel guilty about this. One interesting thing we learned (in addition to tons of intricate and imaginative ways to describe wine, or exactly where each of the cheeses on the cheese plate came from), was that Aria’s Head Sommelier (wine person) had been awarded Sommelier of the Year by the Sydney Morning Herald this year, which is apparently huge. And the restaurant has also won several awards for its wine list (?). Not that I’m the kind of wine drinker who is able to really appreciate something like this (see above). Apologies to all my friends out there who would have done that list justice! (But it could have been worse: if they were an award-winning brewery, I wouldn’t even have wanted a sip… I know, go ahead and shake your head at me. Beer just tastes like bitter, dirty water to me). Daniel and I were a bit confounded by the menu, despite having looked it over online ahead of time. There was a list of entrees, but then another list that said “main courses.” I thought entrees were main courses! Apparently in Australia, they are appetizers. So we eventually decided on our main courses and then chose to split an entree. We almost got the Peking duck but it included “shaved abalone” and Daniel was a little scared of that. So instead we selected “Kurobuta pork belly with pork croquette and caramelised apple.” Would you believe it was really good? Crisp on top, with a creamy almost lard-like something between that and the meat – I know that sounds horrible but it was actually good. (However, the stomachache I had later that night makes me think my stomach does not like digesting pig stomach. Which… makes sense when put that way). That’s right – no photos of the entree or main course. Had you been there, you would have thanked me for finally telling Daniel he wasn’t allowed to take any more photos of our table or our view after the 5th snapshot of that wine glass. But the best part – by far the best meal I have ever had in my life – was the lamb. Oh that lamb! I’ve never tasted anything like it! The menu called it “roasted rump with ricotta gnocchi, pumpkin and mustard fruit purée and a sage and balsamic sauce.” I call it amazing. I couldn’t decide what made it more life-changing – the texture or the flavor. It was so rare that it hardly seemed cooked at all. Probably what they call seared (but they said it was roasted? I don’t know). But although I would have expected not to like something like that, it was amazing! The flavor was incredible. It did have the slightest hint of a recognizable lamb flavor, but mostly it just tasted like something else entirely. Something wonderful. And the texture! It was silky and smooth and firm – kind of like sashimi. But what might have been even more delicious than the lamb were the dabs of potato-y, creamy, cheese-y stuff, layered on top of some of the finest puree of sweet potato I’ve ever had (I guess that was actually the ricotta gnocci and pumpkin, but I was experiencing, not studying for a written test). There was also this cube of some kind of herb-y thing, breaded. I definitely tasted parsley but I wasn’t sure what else. It was a bit too strong for me, and I let Daniel finish mine since he really liked it. It was the most I’ve enjoyed a meal in … a really long time. We agreed that our previous disdain for ritzy meals like this one, where your plate is enormous and the amount of food on it is laughably small, was probably either because we hadn’t savored those meals enough, or because the food wasn’t really very good. This food was good food, and I didn’t want any more than the tiny amount on my plate. It was a good deal less food than we’re given at most places we usually eat, but it was just the right amount because I was savoring it and it was so rich and good that I wouldn’t want anymore than that. It was certainly one of the most contemplative meals I’ve ever had, and it was an incredible experience overall. Eating something so fabulous that I literally savored every single bite. 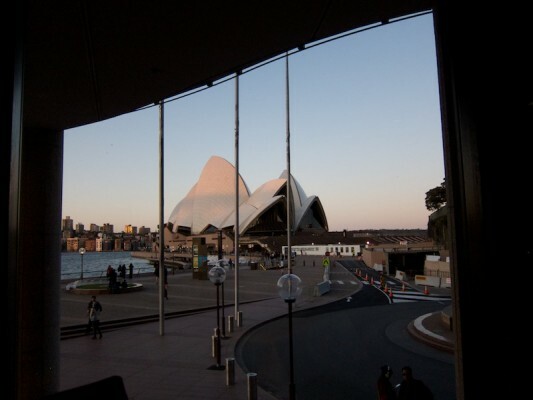 While gazing out the window at something as exquisite as the Sydney Opera House, which truly is as much a work of art as it is a functional building. It’s like a sculpture. And with the setting sun letting the sky relax into a deep blue it was just … unforgettable. I remember saying to Daniel, “What am I going to do after I take the last bite?” And yet when the last bite did come, I was ready. 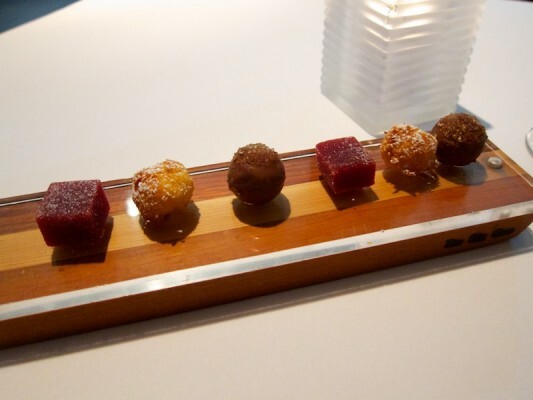 Actually I wasn’t ready for the meal to be over until after the petit fours they brought us, complimentary. Three for each of us - a raspberry coulee, a toasted coconut one that was incredible, and a truffle with coffee sugar on top. Oh my gosh, they were amazing. I had half of each teensy one and it was enough for me (except the dense, nutty, mild coconut one - I ate all of that). Then I was done and really just didn’t want any more. It was the best example of feeling satisfied I may have ever felt in my life – I felt that all of me was satisfied: my taste buds, my stomach and my soul. (Obviously food can’t thoroughly satisfy all of the soul’s needs, but I think our souls can feel a satisfaction from experiences of beauty and savour.) My whole body felt happy. Oh it was wonderful too. 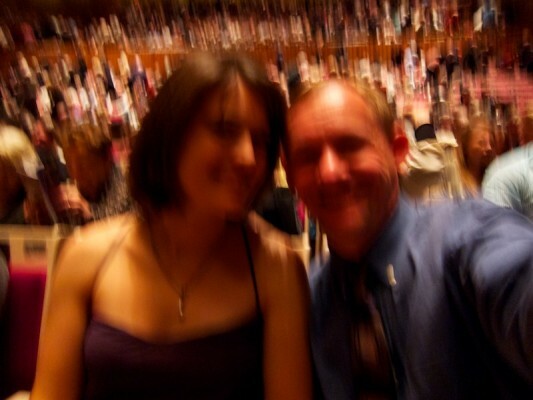 Our blurry and illicit in-the-concert-hall shot, moments before the music began. We were seated in the very front row, just to the conductor’s left. I was immediately below the 1st chair violinist, and I loved it! I know it’s not the best seat in the house because you can’t see the entire orchestra and your neck has to strain a bit from looking up so much, but we both loved getting to sit so close to the orchestra that we could really see them up close and watch them play. We were close enough that I could watch their eyes moving across the page as they read the music. The 1st chair violinist was incredible. All I could think when I watched him was how relaxed he was. Every minute movement he made was completely relaxed and completely efficient. It was exquisite. Looking back and forth from him to the violinist behind him (who also looked like she was very comfortable with what she was doing), the difference between their hands and faces was palpable – whereas her fingers tightly held the bow, it was as though the bow was part of his hand, growing out of it. And his face – completely relaxed the whole time. But I have to admit, my favorite musicians were the ones who really got worked up, the ones who may have expended excessive energy and strain through their faces or by shaking their heads to the beat, but their passion just inspired me and made the music come alive for me. They were really feeling the music, and I couldn’t help but be moved by it. As soon as the performance began I found myself falling in love with the cellos. The sound pouring from that section was so buttery, so low and mellow, I couldn’t help myself. I’d never noticed the cello before. And then I fell in love with the violins – so sweet, so light. Sometimes pinpricks of light, sometimes sweeping swings of melody. Then I fell in love with the conductor – a jolly little Irishman who obviously loves nothing NOTHING better than music. He conducted that orchestra with not just his arms, but his whole body and face. He was so much fun to watch – he marched with a scowl on his face when the music called for it, he laughed, he grinned, he danced. I think I’m making it sound more unconventional than it actually was – he wasn’t weird. But within the realm of normal I was fascinated with how engaging he was to watch. I was struck with how personal and interactive it is to see a live performance. It helped that we were in the front row, but several musicians and I made eye contact throughout the evening, which reminded me that they were humans too, not just performers on the stage. I know that we the audience were touched and influenced by their energy, but likewise they seemed influenced by our energy as well (through applause, etc.). The music grew forth from the unique group of us who were there, both those playing it and those listening to it. I felt like I was part of that performance. Funnily enough, we heard later that this particular performance was recorded to be used on the radio. Nice. Too bad I didn’t sneeze or something. Then I could say I’d been on national radio in Australia. I loved the physical element of it being a live performance. I was aware, when the trumpet soloist was playing, of his breath – how it was directly producing all that sound I was hearing. I could hear him take in his breath sharply in between. I was in awe of his command of his airways – able to measure and economize every breath to produce such amazing sounds: long, short, soft, loud, quick. Not to mention what I saw his fingers doing. That goes for all the strings at various times too (I couldn’t see anyone else). It felt like such a gift being given to me by the musicians – a very physical gift born out of their bodies with sweat, muscle and breath, and given freely to us, to do with what we wished. We could listen to it, ignore it, remember it, let it touch us, block it out, judge it. It was very beautiful to be given such a gift, and so freely. But overall? This evening was amazing. I’m so lucky to have a husband who treats me like his princess, not to mention every day in which he serves and cherishes me. Here’s to 90 more anniversaries together, my love! Kind of a bad shot, but it shows the moonlight on the water, which was such a magical part of the evening. 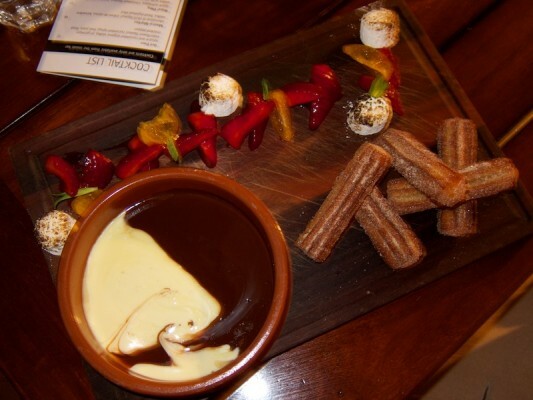 Dessert at the Opera Bar - churros, strawberries and toasted marshmallows with melted chocolate. At the end of the night, waiting for the ferry home. 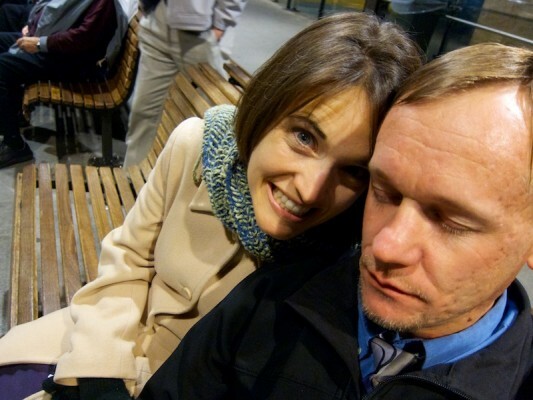 Daniel's fake "asleep" face didn't really fool anyone. Beautiful, mesmerizing, enchanting. I felt like I was there. You describe things beautifully Katie. What a wonderful experience for you both. And if also sounds like there’s a chance you might turn into foodies! For the record, we’ve come to determine that at restaurants of that sort, no one cares if what you do seems a little out of place. As formal as they are, they always seem terribly relaxed about it all as well. Oh, I love reading this! These kinds of experiences really are a joy, aren’t they? Matthew and I have learned that as a rule, it’s hard to go wrong with pork belly. Frankly, pork belly is simply the cut of meat that they make bacon from, so it’s super rich and usually crazy delicious. And I concur with Matthew, if it’s really about the food, the folks at those restaurants don’t judge. They’re happy to help you out if you ask.